Vladimir Putin's Russian forces remain poised for a possible takeover of neighboring Ukraine. Nuclear-armed North Korea is ruled by an unstable, nihilistic dictator who constantly makes new threats against American allies and the United States itself (along with some of its filmmakers). The Islamic State terrorist group slaughters as many people who cross its path and poses a credible threat of genocide against the ancient Yazidi people in Iraq. 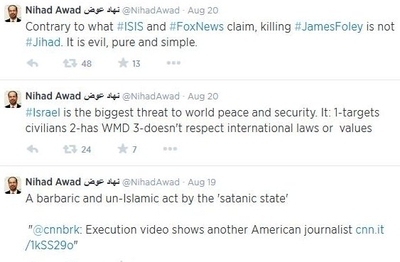 What's especially bizarre is that Awad's assessment on Twitter is bracketed by tweets critical of ISIS' brutality, which were posted after ISIS released video showing the vicious killing of journalist James Wright Foley. Awad writes that Israel "targets civilians." This is demonstrably false, given the warning calls and leaflets Israel's military drops before targeting terrorists who do target civilians with the rocket fire, or the leaders of terrorist groups like Hamas and Palestinian Islamic Jihad who sanction those attacks. This is no mis-statement by Awad or an aberration. In July, he called for, "People of conscience: Declare Israel as a terrorist state for the war crimes it has been committing against civilians." We've repeatedly shown how CAIR was born out of a Hamas-support network in America; how its officials – Awad included – never utter a critical word about Hamas; and how they leap into action as "defenders of the Palestinian cause" when Hamas initiates violence. If Not Profiling, What then? We need to ask our Department of Justice head, Eric Holder what are his views on stopping terrorist at our borders, if not profiling and restricting travel by those seemingly sympathetic to terrorist causes? Surely, Homeland Security, DOJ, FBI, CIA and NSA have all families here in the USA that demand their concern and protection from these terrorist and therefore, must have a vested interest in the protection of our nation from within and without. Tell me they do, please!